Two events mark their passage in the next day or so. One of of course is Gary Gygax's birthday who would have been eighty years old on Friday. Its a bit hard to process this in 2018 because Mr.Gygax's death seems to be fresh in my mind. 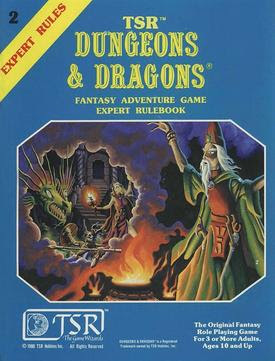 The other thing that's on my mind is B/X Dungeons & Dragons once again. The Dungeons & Dragons Basic Rules (1981), by Tom Moldvay,yet it seems like its still the 'new' set. 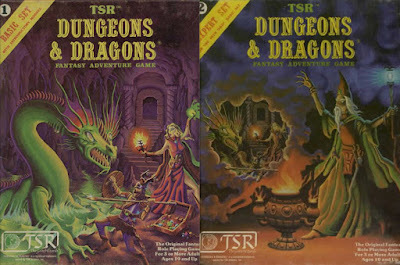 For me the magenta box sets are the standard for Dungeons & Dragons to a certain extent. For me Moldvay/Cook is just a continuation of original Dungeons & Dragons warts & all. "Whereas Holmes' Basic D&D was mostly a matter of organization and explanation, Moldvay's Basic D&D also engaged in simplification. Thus, for example, there were no longer separate character classes and races. The twelve race-and-class combinations of Holmes' Basic D&D (including things such as the elven fighter/magic-user multiclass) became just seven classes in the new Basic D&D: clerics, dwarves, elves, fighters (which had still been "fighting men" under Holmes), halflings, magic-users, and thieves. Moldvay's second edition also cleaned up character alignment, constrained spell choice, and even improved the layout of the book. All around, every effort was made to upgrade the game for starting players. As for the results, even former editor Holmes said, "I think the new Basic Set rules are an improvement over the first edition. Not a big quantum jump ahead, but better in a number of minor ways." 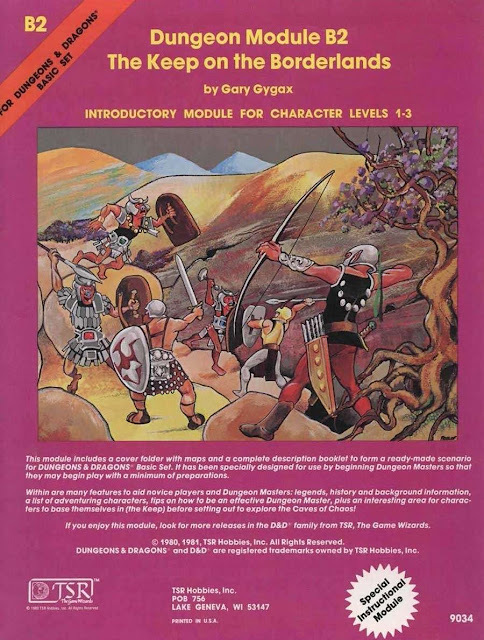 Moldvay's Basic D&D was enough of a change from the previous edition of the game that it was actually a "new edition" as it's understood in the modern roleplaying market, which was a pretty rare occurrence in the 70s or early 80s. The Basic Set was (as planned) released simultaneously with the new Expert Set by David "Zeb" Cook, which expanded Basic D&D to levels 4-14. Gary Gygax mentioned a "Masters Set" around the same time, which was to cover levels 15-36, but that wouldn't appear during Basic D&D's second edition." The Expert Set edited by Dave Cook is still one of the best continuations of the B/X game out there. Folks are still playing Expert & continuing on with the legacy started by Gary Gygax. To a certain extent I'm waxing nostalgic for B/X. The game seemed more open for customization totally different then conforming ways of Advanced Dungeons & Dragons first edition. B/X was the choice for many of us who want to run a pick up game. Just last night I was talking with a friend of mine about a game he ran with a group of new players who were friends of his son from school. 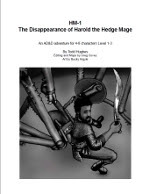 Taking the free module from Dragon's foot.org HM1 - The Disappearance of Harold the Hedge Mage by Todd Hughs. He had the group set up with PC's, the map laid out, & the players set up in less then a half an hour. There are several areas that could be used in Harold to hook up with B2 Keep on The Borderlands by Gary Gygax. This also means that HM1 could be used as a buffer adventure on the way to the climax of T1-4 Temple of Elemental Evil by Gary Gygax & Frank Mentzer. The goal of course is for the players to have fun but this sort of an adventure path is going to result in more then a few of the PC's dying by the hands of the humanoids & monsters scattered throughout. I'd make sure I'd have a few extra PC sheets on hand. The set up here is the expanding growth of the cults of Chaos & intertwined elemental evil religion gaining far more then a toe hold in the region of your campaign or Greyhawk. Power is on the rise & the altars of evil will be slick with the blood of sacrifices but only the PC's can stop the blood bath in time.